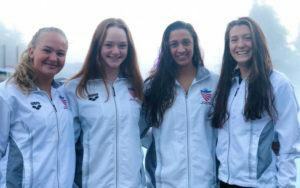 USA Synchro recently named seven elite athletes to its senior national duets. Spain’s Ona Carbonell grabbed two gold medals this weekend in Long Island (USA) at the sixth meet of the FINA Synchronised Swimming World Series 2017, being the best in respectively the Solo and Duet routines. She topped the Solo event with 182.8424 points. She was followed in this order by Canada’s Jacqueline Simoneau (178.2041) and Michelle Zimmer (GER, 155.5901). Together with Paula Ramirez, the Spanish pair performing to the theme “Spanish culture” with a bit of flamenco, took gold in the Duet routine with 180.8160 points, defeating the Canadian Simoneau and Claudia Holzner (silver, 175.0678) and Anita Alvarez / Victoria Woroniecki (USA, bronze, 168.3435). In the highly-anticipated mixed duet technical programme in which the 2015 World champion Bill May of the U.S. and his new partner, Kanako Spendlove, took the top score with a steamy routine that earned them the lead (86.3349 points). Canada’s Robert Prevost and Isabelle Blanchet-Rampling took silver in 162.4065 and Germany’s Niklas Stoepel / Amelie Ebert came third (145.4847). 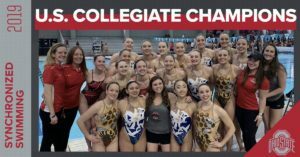 USA topped the team event to get second gold in the Series with a total point of 166.2664, while Canada took silver in 163.2074 and Argentina bronze (153.3469). Press Release courtesy of FINA.